There are many factors that play into winning an NBA title, but one of the most vital, is having one of the four NBA titans in the organization. It sure is hard to win a championship when going up against an all-time great player. That’s a given, but if you have to go up against one of the four titans of basketball, it is impossible. In the NBA, there have been four men in basketball that have dominated the league for roughly six decades. Red Auerbach has sixteen rings, as a coach and general manager. Phil Jackson has eleven rings as a coach and player. Pat Riley has nine as a player, coach and president and Gregg Popovich has five as a coach. These four guys have won 41 of the 68 NBA championships, and have impacted countless coaches and players throughout their careers. If you go through recent and all-time NBA championship history, you will see the names of many of the greats: Bill Russell, Larry Bird, Magic Johnson, Kareem Abdul Jabbar, Michael Jordan, David Robinson, Tim Duncan, Shaquille O’Neal, Kobe Bryant, Dwyane Wade and LeBron James. What do they all have in common? 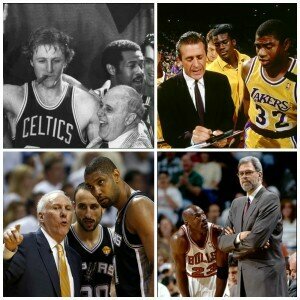 They all only won their championships while playing under one of the four greatest coaches ever. Auerbach continued to thrive as a GM throughout the 70’s and 80’s with the Boston Celtics; trading for Robert Parrish, Kevin McHale and Dennis Johnson to build around Bird. Pat Riley won five championships coaching Magic and Kareem in the 80’s, Shaq and Wade in 2006 and, even though he had stepped down as a coach, Wade and LeBron James in 2012 and 2013 as the Heat’s team president. Jackson had Jordan for the 90s and Kobe for the 2000’s. Popovich took over as the Spurs head coach in 1996 and hasn’t missed the playoffs since his second year. All four of these coaches have an impact on this game that spans over the last 58 years, and will continue to do so for years to come. So how does all of this relate to today’s NBA? Auerbach passed away nine years ago, Jackson and Riley are now cooped up in the front office, and Popovich is the only one still coaching. To bring it all home, you have to look at the NBA as a tree with thousands of branches. It is a fraternity; everyone is connected in one way or another. And all great players and coaches have been touched by one of the four founding fathers of basketball, even if they don’t work for the Spurs, Knicks, Lakers, Bulls, Heat or Celtics. The last three teams to win NBA titles without direct influence from the founding fathers were the 2015 Warriors, the 2011 Mavs, and ‘04 Pistons. Even they are still connected to the titans of the NBA. Steve Kerr played nine NBA seasons and learned under both Phil Jackson and Greg Popovich. Mavericks coach Rick Carlisle was drafted as a player by Red Auerbach, and played with Larry Bird from 1984-1987. The Celtics drafted Chauncey Billups, Finals MVP of the ‘04 Pistons, in 1997. Simply put, there is no escaping the NBA titans. It is torture to have to face these guys year after year. Take the Oklahoma City Thunder or Las Angeles Clippers for example. Either team could win 60 games; get a three-seed in the uber-competitive western conference, only to face the Spurs in the first round. The talent on the teams would be relatively even, and we know it took a miracle shot for the Clippers to escape the first round last year. Not to mention Popovich could coach circles around first-year coach Billy Donovan, and the Thunder will surely keep an eye on the standings all season long. 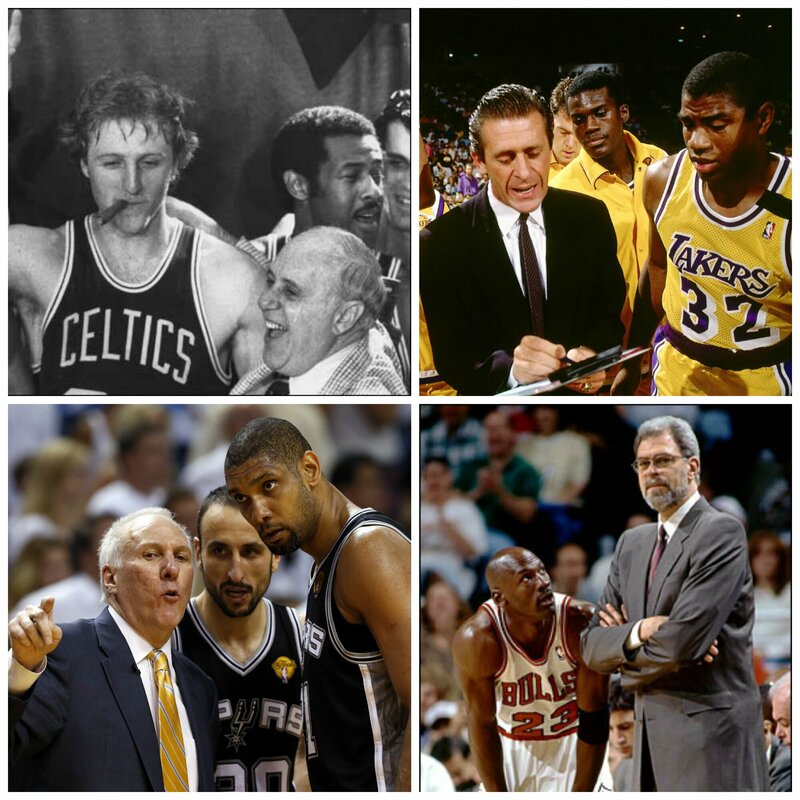 In the last 40 years, teams that didn’t employ one of these four great coaches won only 13 NBA championships. So for fans who criticize Chris Paul, Carmelo Anthony, Dwight Howard, Steve Nash, Charles Barkley, Karl Malone, John Stockton or Allen Iverson for not winning a championship, hopefully can now see how the odds were never stacked in their favor. The most telling part about how influential these four men are to the NBA is the fact that they (who are still alive) aren’t close to done. Popovich signed Kawhi Leonard and LaMarcus Aldridge, setting the Spurs up for 10 more years of contention, and will also be coaching in the Olympics. Riley still has Wade and Bosh, and can build around the core of Hassan Whiteside, Goran Dragic and Justice Winslow. The Heat are always in play for the trade deadline, where they could make a move to get a big star like Carmelo Anthony or DeMarcus Cousins. Phil Jackson will be making moves for the Knicks for the foreseeable future, and already got off to a good start by drafting promising rookie Kristaps Porzingis. He could keep Anthony or trade and rebuild with his own foundation players. Jackson has taken over a team that was formed without him, and it will be interesting to see how he puts his mark on the franchise a few years from now. One of these four NBA pioneers have taken turns dominating the league since 1957. Popovich is the only one still roaming the sidelines, but he is signed with the Spurs through 2020, and could continue coaching or become an executive in San Antonio’s front office afterwards. The NBA’s titans have always been and will always be the most unstoppable forces in the NBA.